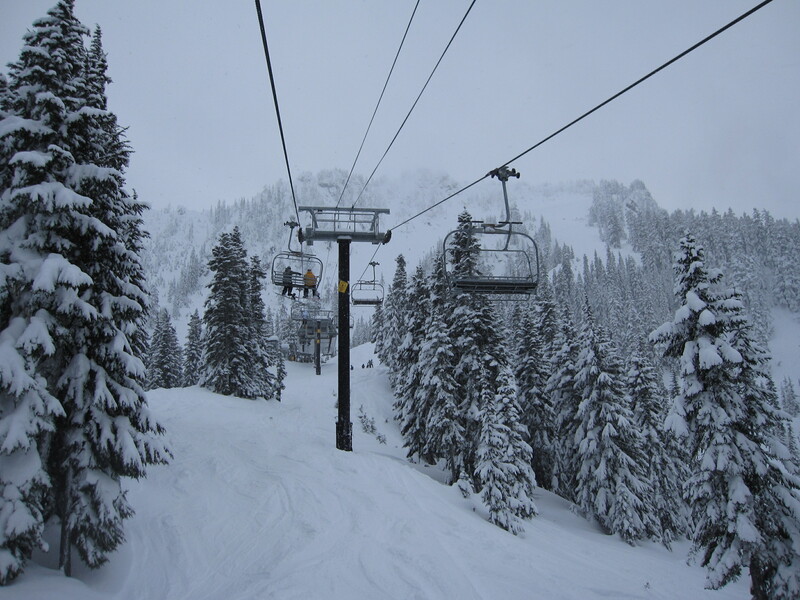 Stevens Pass is one of three major day use ski resorts near Seattle that operates Riblet, CTEC and Doppelmayr lifts. The new resorts are expected to add more than $35 million in incremental annual EBITDA to Vail’s bottom line upon closing this summer. Vail plans to invest $35 million in capital improvements at the four mountains in the first two years, which is almost certain to include some new lifts. It is with a great deal of mixed emotions, yet, with tremendous hope for the future that we announce we are selling Triple Peaks LLC, which includes Okemo Mountain, Mount Sunapee and Crested Butte Mountain. First and foremost, we want you to know that this was the hardest decision we have ever made, especially as we begin to transition through this deal and say goodbye to each of you. 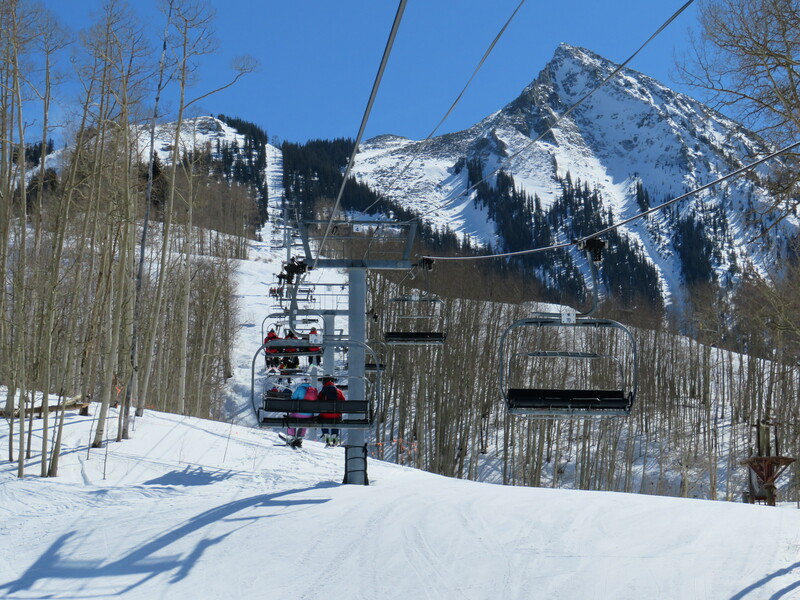 Recently, Vail Resorts approached us to buy out our leases and the operating companies for all three mountains. They recognized the distinct locations of our mountains, the incredible knowledge and passion each of you have, and the remarkable service you all have provided to millions of guests. Vail Resorts saw excellence and inquired about a possible purchase. We took a long time to think about how we wanted to proceed. But as mentioned before, this was far from easy. We kept asking ourselves the questions: What does this mean for us? For our teams? What does this mean for our communities and the mountains that we have poured decades worth of passion into? We were not naïve in realizing this would mean changes as the future unfolds. We spent a lot of time contemplating all of this, and decided that moving forward with the sale was in the best interest for the future of the mountains, our employees, communities and our loyal guests. As we look 10, 20, 30 years down the road, we ultimately decided that now would be the right time. Over the last 36 years, we have come to know many of you like family. We have laughed, cried, raised children together, learned from each other, celebrated successes, skied some awesome runs together, all while growing Triple Peaks into a successful company. For this we feel so fortunate, forever grateful to you for your support through it all, and yet so sad to say goodbye. We realize that you will have many questions around the sale. What does this mean for you and your families? Each of us are here to help answer those questions as best we can. While we cannot perfectly predict the future, we have spoken with the Vail Resorts team at length about company culture, structure, and employees’ futures. We are truly confident that Vail Resorts is the best company to lead our resorts moving forward. We feel that there will be great opportunities for many of you, both vertically and horizontally across their organization. We know that they invest heavily in their team’s professional development, so we know that you will be in a good position to continue to grow in your careers. Vail Resorts will also be able to invest in each mountain, continuing the remarkable growth and bolstering the legacies of our resorts and people. We have always been very proud to be family owned and operated, and while this is changing, it is changing in a very positive direction. With all of this, we feel very optimistic about the future of the resorts. We look forward to witnessing the success continue and watching each of you grow. Thank you for all of the unwavering dedication, the years of hard work, your smiles, and your friendships. That letter sure is classy (and heartfelt) alright. These recent aquisitions are making me consider whether to go with the Epic pass or the Ikon pass. Any speculation as to the logic/rationale of excluding Mountain High from the deal? Seems like it would have been an ideal fit as the last remaining option to draw skiers from SoCal into the Epic network as a thorn in Alterra’s side. I can’t imagine this is a positive for MH – why wouldn’t Vail have swooped in if they thought it was an attractive asset? -Karl’s group owns Mountain High outright while Stevens was owned by Oz Real Estate, which seems to be winding down its ski resort business. -Southern California is in a mega drought right now and maybe not the best place in skiing to invest. As an LA resident, I can say that MH isn’t super well-regarded by locals. You can drive an hour further for respectable skiing in Big Bear. Thanks Peter. That all makes sense. Certainly agree on the last point b/c MH snowmaking is sourced from wells and therefore highly sensitive to precipitation patterns whereas both Big Bear mtns can draw from the lake with much less variability. I was at Big Bear in April and not only was there zero snow left but the lake looked way down. Waterfront homes weren’t so waterfront anymore. I feel for anyone trying to run a ski resort in the region. This immediately brings to mind the other Epic Pass affiliate resorts that are not (yet) owned by Vail: Telluride and Resorts of the Canadian Rockies (Fernie, Kicking Horse, Kimberley, Nakiska, Mont Sainte Anne and Stoneham. When do anti-trust concerns come into play? It probably depends on what Boyne and Powdr can do in terms of investment. If they keep up with Vail and Alterra, then all should be fine. There is the need to consider that a lot of these resorts are regional, and not destination. Now let’s talk lifts. I’ll focus on the east since that’s where I live and ski. Okemo is sitting pretty relative to their neighbors and ranked number 1 in the east for lifts. Their oddball lift is the Doppelmayr Green Ridge Triple in a sea of Poma. It’s also a long slow ride and is useful to get to the summit from Solitude or Jackson Gore without riding the Sunburst or going to the bottom. That could be upgraded to a high speed quad, possibly with the Okemo signature Orange bubbles. The bubblization of the Jackson Gore Express resulted in a significant decrease in capacity so maybe that could be upgraded to a bubble 6 and relocated to replace Green Ridge. Lengths match well. 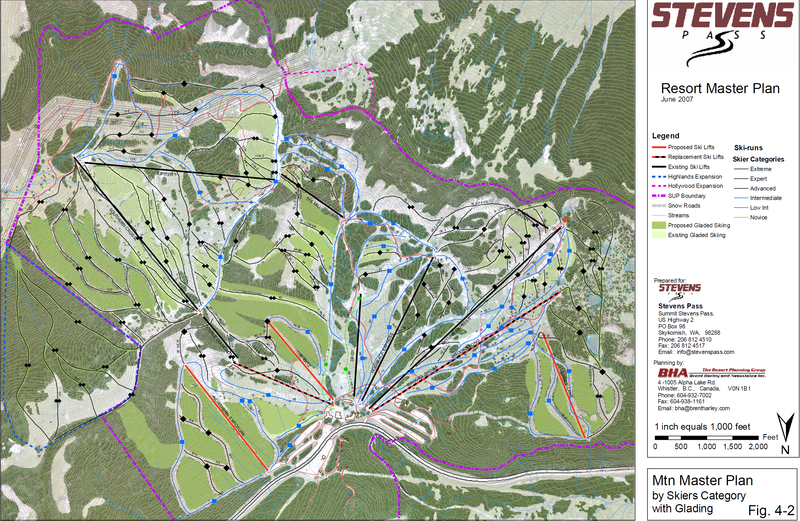 At Sunapee there were already the lift projects in the pipeline but both were relocations. Vail could follow through on them or build new lifts instead. There’s also talk about the West Bowl expansion or whatever it’s called which would be helpful in handling the extra skier visits brought on by the Epic Pass since it’s close to Boston. At Sunapee, Vail seems more likely to build a detachable quad on North Peak rather than relocating the fixed-grip quad from the boneyard. The quad could go to Solitude and a new high-speed quad added in West Bowl. At Crested Butte, Vail will not like the lack of safety bars on Teocalli and could do a high-speed quad there. Twister also needs to be removed and possibly replaced. Red Lady and/or Silver Queen could become six-packs. The Teo 2 expansion could also be approved in the next couple of years. Lots of opportunities for Vail to consider. Or they could spend all $35 million on a sorely needed parking garage. For Okemo the obvious lift upgrade would be to replace one of the South Ridge Quads, probably the B quad as it is older, with a detachable quad or six. The other possible upgrade most people think of at Okemo is to replace the Green Ridge with a detachable as well. The problem with doing this though is that the base of Green Ridge is above Mountain Road. Mountain Road to lower arrow is already over congested as is. Replacing Green Ridge in the same location would do little to relieve this. And lowering the base of Green Ridge would just put more people on Mountain Road where it cuts across all of the Solitude trails. What I would do is remove Green ridge, and put a lift, possibly a used fixed grip, that starts somewhere around Jackson Gore Junction, and ends where Green Ridge does now. The lift line would run right up the Sweet Solitude trail. This would create a nice pod for the green runs and the glades on this part of the mountain. It also would allow people coming from Jackson Gore to get to Okemo summit without having to go down Mountain Run to Lower Arrow. Therefore a lot of the traffic on Mountain Road would decrease making the Solitude pod a lot better and this would. IMO a better place to put a detachable would be to replace Sachem which is underutilized these days due to the long lift ride and it starting right near the Sunburst Six. This would relieve traffic on the Countdown trail, and take some pressure off Sunburst Six as well. 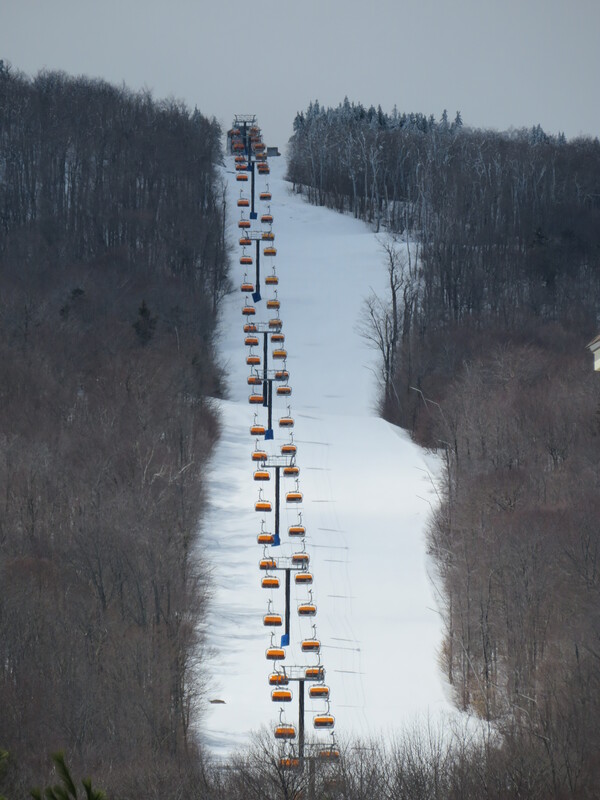 It also might drive more people to use Glades Peak. For Sunapee, replacing North Peak with a detachable is a bit overkill, but Vail might not care and do it anyway. It is more important to put in a lift up Cataract ASAP still. There need to be a way to allow people to use the Sunbowl pod when the Sunbowl Express is broken down or on windhold as that pod is nearly a third of the mountain’s terrain.